Children at St Mark’s church will be rolling up their sleeves and laying down new roots in their community by planting trees in part of their church garden during The Tree Council’s 2018 National Tree Week (Saturday 24th November to Sunday 2nd December). With the help of a grant from The Tree Council, one of the UK’s leading tree charities, they will be planting five apple and three pear trees in the holes prepared by a group from “Open Country” in Wetherby last week. The planting will take place during the morning church service at approximately 10.50 on Sunday 25th November. The Tree Council awards grants in order to encourage communities around the country to plant more trees and do something positive for their treescape. St Mark’s Church is one of 38 schools and community groups across the UK that made a successful application for a share of grants this year. Jen Dening, who co-ordinates the gardening team at St Mark’s, said that it is important that children know where their food comes from and how it gets from plant or tree to their tables. Apples and pears are great snacks and we hope that the fruit will be used at the “Pay-as-you-feel” café which operates in the church Community room on a Wednesday and once a month on a Saturday, as well as offering it to the local community and congregation. Last Sunday, the children learnt how the flowers are pollinated and that bees are essential for this. Also, what is necessary for growth of a healthy tree. Children from school years 7 and 8 have been asked to bring spades and wellys and the younger children will be watching as they plant the trees. National Tree Week is the UK’s largest annual tree celebration, marking the start of the winter tree planting season (November to March each year). St Mark’s church is listed alongside events across the country on The Tree Council’s website (www.treecouncil.org.uk). More information about National Tree Week is also available by calling The Tree Council info line, 020 7940 8180 or searching #NationalTreeWeek on Twitter. You are welcome to send reporters and/or photographers but need to be aware that some children have not given permission to be photographed. Press enquiries: For more details contact Jen Dening, 01423 874304, or 07974934366 or the e mail above. The Tree Council (founded in 1973) is one of the UK’s leading charities for trees, promoting their importance in a changing environment and working in partnership with communities, organisations and government to make trees matter to everyone. As the coalition body for a diverse range of organisations, the Council focuses on getting more trees, of the right kind, in the right places; better care for all trees of all ages and inspiring effective action for trees. 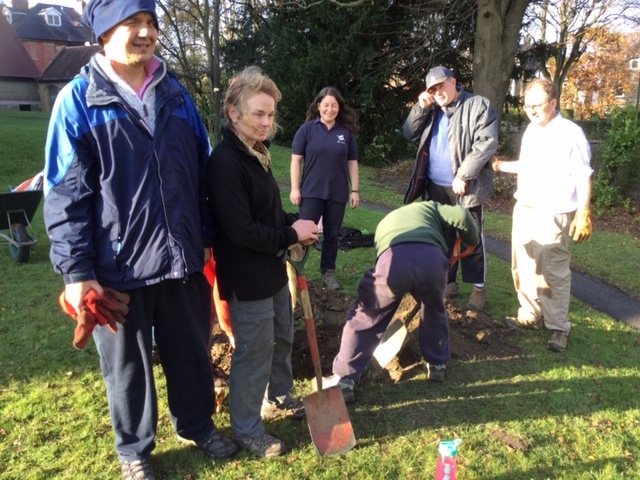 The charity works with its national network of volunteer Tree Wardens and member organisations to engage people in biodiversity and environmental issues and to promote tree planting and conservation in town and country. A major part of this is achieved through its annual Community Action Programme which includes Walk in the Woods month, Seed Gathering Season and National Tree Week (celebrated every year since March 1975), as well as through supporting groups organising local events. It also offers a grants programme for UK schools and communities to plant trees, orchards and hedgerows and create woodland habitats. National Tree Week is the UK’s largest annual tree celebration, marking the start of the winter tree planting season (November to March each year). The Tree Council, one of the UK’s leading charities for trees, first established National Tree Week in March 1975 in response to the national replanting required after the outbreak of Dutch Elm disease. National Tree Week is a great chance for communities to do something positive for their local treescape. Each year, The Tree Council’s member organisations such as voluntary bodies and local authorities, up to 200 schools and community groups, their 6,000 strong network of volunteer Tree Wardens and many others, support the initiative by setting up fun, worthwhile and accessible events, inspiring upward of a quarter of a million people to get their hands dirty and together plant trees.